Review by Laura E. Barone, a candidate for the MA in Art History at Richmond the American International University in London. Aidan McNeill’s first solo show, Cast, is a stunning photographic and filmic induction into the world of the theatre. Her photographic works are powerful images not of thespians, but of the physicality of the most basic elements of the theatre – the lights and the stage. Add some smoke effects, high angles, color swatches, and a camera to McNeill’s hands and the theatre puts on an altogether different kind of production. The seven photographic works, entitled Revolve I – VI form a series of images that are almost other-worldly due to the billowing effect of projecting different colored lights onto heavy smoke from a machine. The same flat, black stage serves as the background for each photograph, indicating location but also possibility, and it is breathtakingly transformed with just a few added elements. In Revolve I, a blast of tornado-shaped beiges and blues swirl powerfully together, creating an almost baroque intensity and three-dimensionality that conjures up associations with the Dust Bowl. The horizontal stage has become the vertical backdrop to an intense storm. By contrast, Revolve V is shot from such an alarming angle and cropped so that the stage appears to plummet drastically downwards; with thick white and blue fog occupying the space of the ‘decline’, the colours and movement of the smoke appear to create a steep and vigorous waterfall. Cosmic oranges and purples wisp across the ‘landscape’ of the stage in other images and transport viewers to a cosmic view of far-off galaxies. The imagination is welcomed to get lost in the photographs and to delight in playing with the theatricality of it all– anything big, dramatic, and incredulous will fit particularly well. But there not all is romance and majesty – there are elements of work and human traces that McNeill does not leave out and which are crucial to lending the photographs greater depth. The theatre has its own geography, its own way of mapping people, things, lights and music in and through its unique space, and McNeill grounds her work with this recognition. Human traces are indicated by tape marks, usually set or prop indicators, as well as vents, and even trap doors. These marks are signposts for human activity, for a collectivity of cast, crew, technicians, and musicians who put on the show each and every night. The cast, the show’s namesake, might be what theatergoers first see, but it is certainly not all. McNeill herself works with lighting at the theatre where these images were shot and she knows the labour required to create a seemingly flawless display – much like the often overlooked contrived nature of photography itself. In addition to the photographs is a video installation, Performance 349, a live taping of a major West-End musical in which viewers are positioned in the pit, looking up at the conductor and out into the balconies. The music is muted, and all that can be heard are verbal cues for lights and other effects, mundane combinations of letters and numbers said, as the title indicates, for the three hundred and forty-ninth time. The decided passion of the conductor (he often dabs his sweat off with a hankerchief) contrasts greatly with the experience of the person speaking in code whose body is set apart from the emotional drama of the performance. A few members of the audience seated in the first row can be seen as well, and their utter entrancement with the drama on the stage before them makes evident the kind of effect that music, light, and actors in costume have upon viewers, and its strange power. The film is both funny and alarming in the disparities of experiences that people in different positions of power have in the highly coded, planned, and manipulated location of the theatre, and makes viewers question their own perspective and perception. I think that McNeill presents an homage and critique of sorts to the theatre: in her photographs and her film, she recognizes the powerful and moving ability of theatrical effects like light and sound but also brings viewers around on a bit of a tour, allowing us to see the spectacle and enjoy it, and then she dismantles it to present a more nuanced and poignant presentation of the theatre. Birdhead’s concern is the flow of power from West to East, as gauged by that thriving metropolis of ever increasing scale, life and culture: Shanghai. 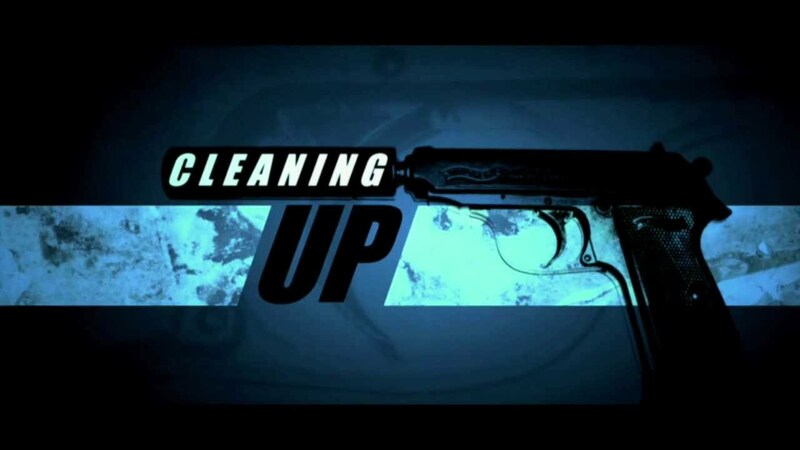 Simon and Thomas Guerrier’s award-winning thriller Cleaning Up staring Mark Gatiss and Louise Jameson is now available to buy. All profits from sales go to help fund a feature-length movie.